SASH Gals: The Enchanted Blog Tour kick off! Hi, I’m Megan Miles of Little Londyn designs. I am so excited to kick off the Enchanted Blog Tour. Excited because I love these fabrics from Riley Blake, that my mom Dodi, designed. I love that I got to sew all these wonderful things for my 3 little munchkins. Yes, I am my mother’s sewing slave! First up is my daughter Amelia in a dress called Georgia from Violette Field Threads. She's getting a bit older now and likes to be a bit more refined and classy. 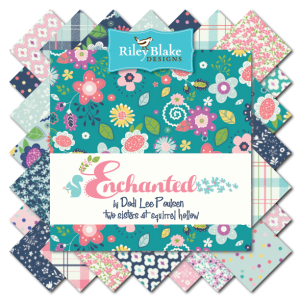 The solid navy blue shade fabric from Riley Blake plays so well with the Enchanted fabrics in the skirt. She could twirl in this dress for hours!! Little Miss Lucie is my princess girl and loves anything with sparkle. She wanted her dress to be long and beautiful and this tiny lavender daisy print was the perfect choice with the teal main from Enchanted. Of course, I have to add some sparkle ribbon at the bottom to give the Princess the total look. This dress is the Emily from Violette Field Threads. And I can’t forget my littlest princess that rules the roost at our house, Scarlett. Her outfit is a double layered dress with pinafore. The dress underneath is the Matilda from Violette Field Threads. The pinafore is reversible (yay!) and can give you multiple looks. I love them layered over each other for the double flutter sleeve effect. The pinafore is the Pearl pattern from Violette Field Threads and I used a light mint Enchanted main fabric. I also used lots of navy lace to enhance the overall feel of the dress. 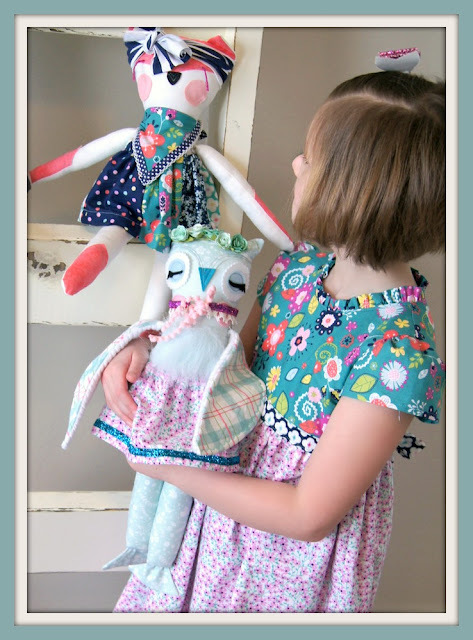 The best part was surprising my little girls with these fabulous 18" animal dolls from Violette Field Threads to match! I‘ve had to put them away until after the photo shoot to make sure they weren’t loved to death. You can’t find anything cuter! Thanks mom for another wonderful line of fabric to get my creative juices flowing! I’ll be your sewing slave any day! Ask for it at your favorite fabric store. This is the just the beginning! Check back everyday for another exciting stop on the Enchanted Blog Tour! Such a great way to show those gorgeous fabrics! Beautiful fabrics and I love the dresses. Sweet fabrics and beautiful models. 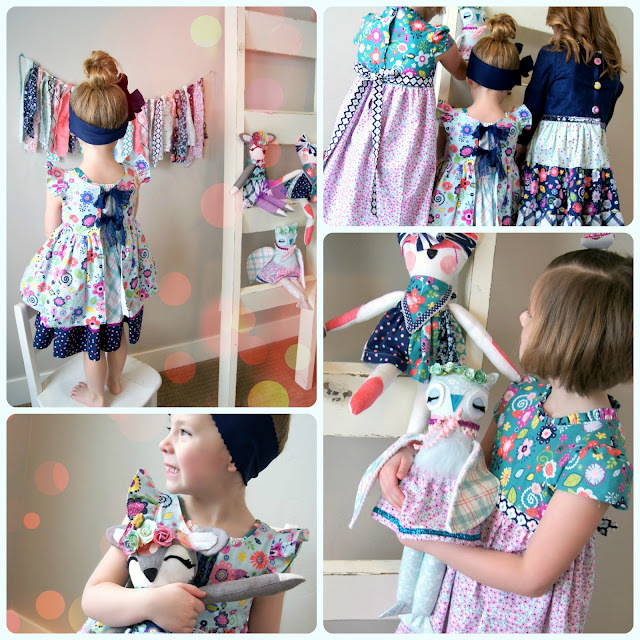 Cute dresses and dolls! The girls were enjoying their modeling job!! Love the fabrics and beautiful girls and dresses. Dollies are the finishing touch. Beautiful girls and beautiful dresses! I love this fabric line! lovely fabrics. these dresses are adorable. our only daughter got into second grade and decided she did not like dresses. Sigh there went all my fun sewing dresses. LOL Now at 29 she will wear a dress for a wedding or such. That is all. Even as a restaurant manager she wears slacks. 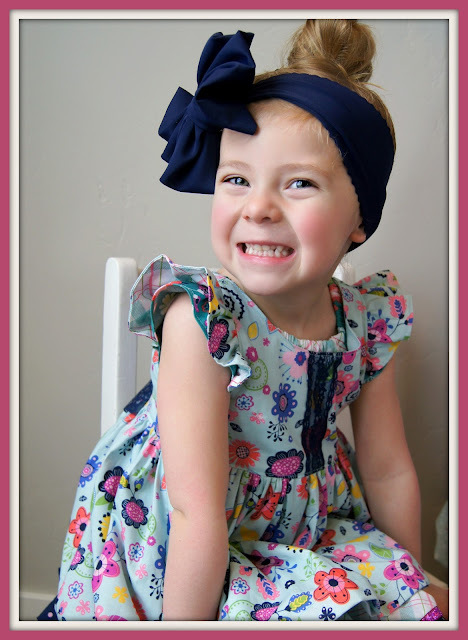 Great photos, adorable models, and a great fabric line! Beautiful dresses...Gorgeous models...and the Animals are Super!! Love the fabrics and the adorable models! I don't have little girls to sew for, but I would love to make quilts and bags from these fabrics. Yummiest fabrics and lovely dresses. The pink and blue plaid that Jedi Craft Girl used is sew beautiful!! Love it - want it. Beautiful creations and your babies are adorable! Those dresses are so cute, and the idea of making matching dolls is precious--those will be treasured memories, no doubt about it. Love Love Loooove the Tote & Quilt "Jedi Craft Girl" shared!!! Beautiful!!! These are so beautiful fabrics!!! Thank you for sharing!! Just lovely, now if I just had a granddaughter for whom to sew! LOVELY COLLECTION! CUTE LIL DEER! THANKS FOR SHARING! How Creative!! Looove the Lil Deer!! These fabrics are soooo beautiful..and versatile!! Ooh, such lovely models and beautiful dresses and dolls! Beautiful fabrics and cute dresses! Great fabric!! Very cute dresses! Cute dresses & adorable girls! lovely inspiration for sewing for my own little girl! Beautiful fabric to make such sweet outfits for cutie-pie girls! Love the fabric combinations! They are beautiful fabrics and girls! I want to make these dresses with this fabric for my granddaughters! I'm a quilter, not a garment sewer, but I love seeing the fabrics used in different ways. You can't make anything more adorable than these dresses for these precious girls and their sidekicks. Those softies are very cute. Such lovely fabric - pretty dresses!!! Cute dresses and cute little girls..love the fabric too! The dress with the bow was wonderful. So fun seeing Linda modeling the apron in your fabric line. And the bags are darling! How adorable are these projects! Such a wonderful collection! Would love to win this bundle! Your daughters are beautiful! Thanks for the giveaway, the fabric is beautiful also! Love the dresses and stuffed toys! I love the navy blue added with all these colors! Thank you for the inspiration to my already owned Violette Field Threads patterns!!! The girls are adorable in their dresses! Love the colors in your Enchanted collection. Thank you for the giveaway. What a gorgeous collection! 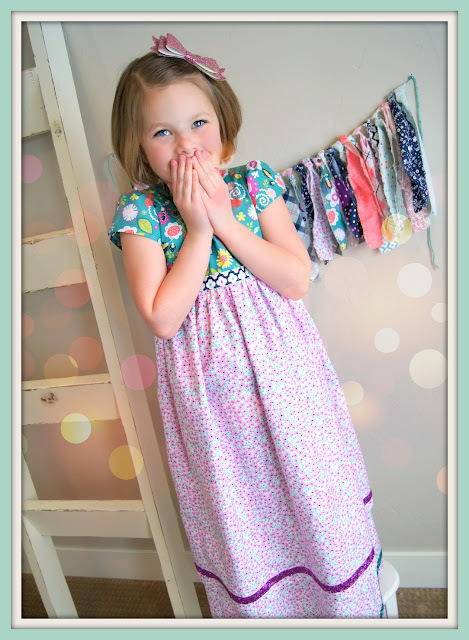 Love those sweet dresses you made with it! I just visited the Crafty Quilter. Her quilt is lovely using your fabric line. I see there will be so much inspiration on this tour. Thank you. The owl is just adorable. So are your sweet girls. Good luck everyone! 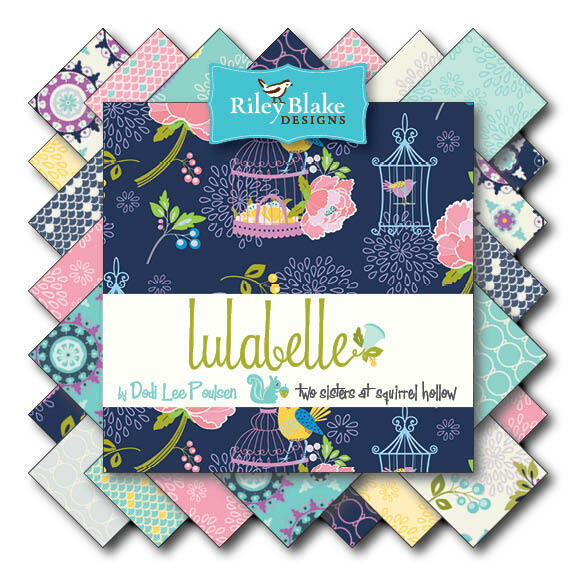 How adorable this fabric line is for creating something new and wonderful! Absolutely beautiful! Love the fabrics and what you made with them. The children are adorable! What a cutie! 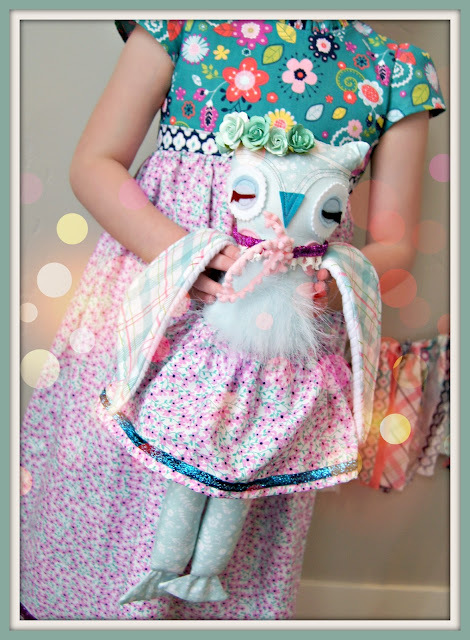 And I love the dressed up owl dolls! Lovely models, beautiful fabrics! My favorite print is the plaid. Beautiful line of fabric...darling little girls...love the dressed up owls! Love those dresden plate blocks over at Crafty quilter! Today I'm going to play with this block even if I just make a table topper. Love to see the effective ways people are using this beautiful fabric. Adorable dresses! I first found out about this fabric line from The Crafty Quilter's blog. I enjoyed seeing the versatility of this fabric, as a quilt and as dresses. 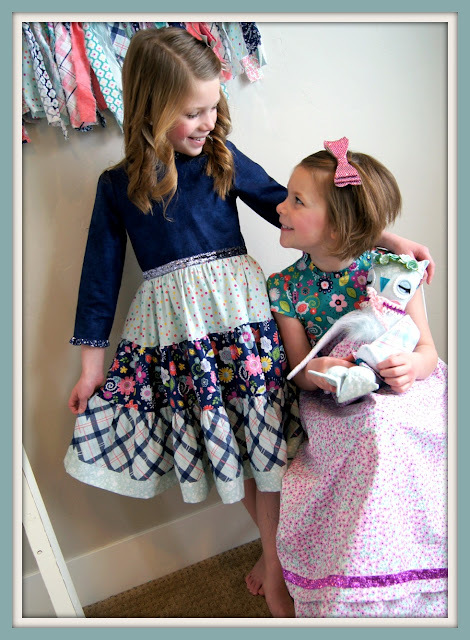 Lovely fabrics and even lovelier little girls ! Oh how adorable! Love the dresses, the little girls, and their dressed-to-the-nines dolls! Fun to see the fabrics come to life! I love this collection! Colors and designs are terrific. Such fun to sew for little girls and the toys are great. Used to make shirts for my boys as well and a couple of these prints would work just great. I can't say enough good things without repeating and repeating myself. This is so cute and I love plaid and retro. Adorable! This fabric line is adorable! Thanks! I love the colors and the variety in this collection. The fabrics are "sew" cute, and the girls are adorable! This is lovely fabric and you did a beautiful job sewing the dresses. The animals you made are adorable. You have given me lots of inspiration for a quilt and sewing a dress for my four year old granddaughter. Thank you for an opportunity to win. Love the Dresden baby quilt. Beautiful colors. Would love to make this for my daughter who is pregnant. Adorable girls and fabrics..Love the Dresden baby quilt...Would love the pattern also. The fabrics are adorable! 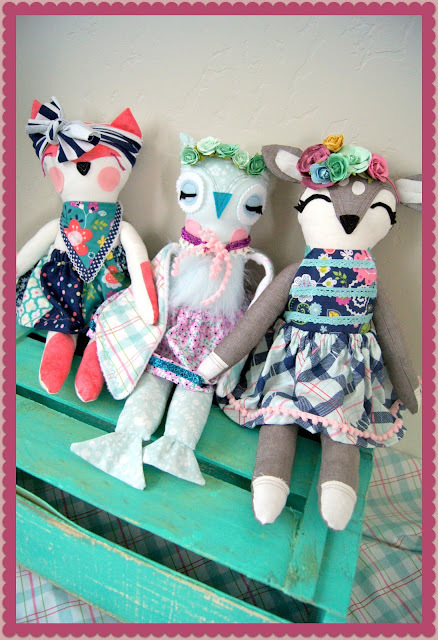 The girls and the dolls are way too cute.. Would love to be sewing on that fabric now! This is a beautiful set of fabrics, and I really love the surprising palette. The navy colors look great with the rest of them. How sweet it all is, the dresses, the girls, and the little stuffed animals! Oh, to be a sewing slave with all that fabric :). Those dresses are too cute! Love these patterns. So glad to have found your blog via The Crafty Quilter and the current blog hop. Your girls are absolutely adorable--great models and great sports. I need to start making outfits and dolls for the grands, so glad to have found this hop. I love being introduced to new fabric lines through a blog hop. This new line is just lovely as are the pretty dresses! I loved viewing these fabrics as outfits on your girls. It just makes me drool about what they would look like in other projects! I would love to use them in a quilt! Looks like I need to go shopping!!! Love the Hexie Pillow on the Jina Barney Designz Blog post!! Awesome job!! 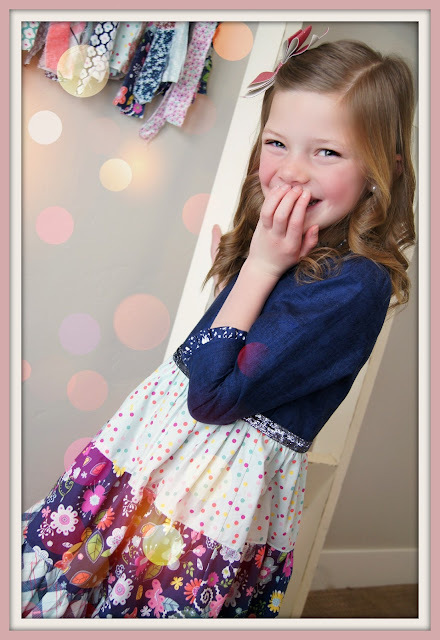 Cute dresses from some great fabrics ... lovely! Beautiful fabric and dresses. So neat that it is Grandmas fabric line. Love the fabric and the dresses! What cute dresses and darling little girls, how fun! Enjoyed the tour very much. I like this line a lot. Thanks. Cute collection as well as projects! Lovely daughters! Thanks for the opportunity to win. 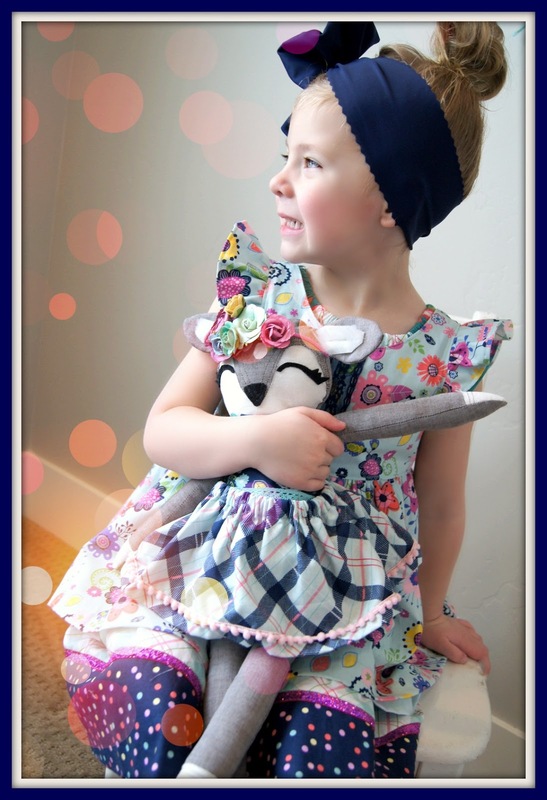 Wonderful daughters as well as fabrics for dresses & stuffed animals with apparel! Neat.